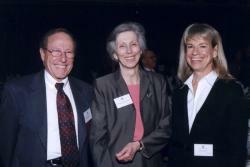 2003 Award winner Judge Harlan Bockman, Chief Justice Mary Mullarkey and Joyce Bockman. Judge Bockman is the Chief Judge of the 17th Judicial District. He was appointed to the District Court Bench in October 1976. Prior to his appointment, he was the Assistant District Attorney in Adams County. Recognized by his colleagues as "the dean of the trial bench," Judge Bockman has heard criminal, civil, domestic, and juvenile cases during his tenure. He has presided in an exemplary manner over numerous high-profile cases, including four death penalty cases. He takes pride in his knowledge of rules of evidence and sentencing laws, and he is a mentor and educator for other judges because of his disciplined study of the law. In the words of his nominators for the Judicial Excellence Award, "Judge Bockman exemplifies the very best of Colorado's independent, merit-based judiciary." Judge Hoppin was appointed to the Jefferson County Court in May 1996. Prior to his appointment, he was a Deputy District Attorney from 1969 to 1972. He practiced law privately from 1972 to 1996 with emphasis on domestic law and criminal defense. He is an active member of the First District Bar Association, a member of the Advisory Board for the Jefferson County Mediation Services, and a current member of the Jefferson County Community Corrections Board. According to Chief Judge Thomas Woodford of the First Judicial District, Judge Hoppin is always willing take on additional work, including assignments in the District Court, and he is especially sensitive to the needs of people in family law cases. He played a pivotal role on a committee within his district to address the current budgetary crisis confronting the judiciary. Magistrate Cole has served on the bench in Boulder for ten years. He is active in the community, promoting judicial issues and improving ways that the judiciary can work with its local community. He is the cofounder of Boulder Prep High School, Justice High School, and Zoubida Colo Junior College, and has received numerous awards, including the 2002 Boulder Valley School District Excellence Award, the 2001 "I Have a Dream" Foundation's Dream Maker Award, and a commendation from Governor Owens for Boulder Prep School in 1999. He has also been a recipient of the African American Leadership Award and the "Beyond the Gavel Award for Outstanding Contributions to the Judiciary and Community." A holder of five graduate degrees, Magistrate Cole has been described by Chief Judge Roxanne Bailin of the 20th Judicial District as "wonderful, creative, and energetic," and as deeply committed to teenagers and to changing their lives and helping them become productive adults."